French toast is a delicious snack and can be served for breakfast. Simple and easy to prepare this can be made in a jiffy and is healthy too! Thinking of french toast takes me back to my childhood days when my mom used to prepare this as an evening snack and I entering the house tired after school smelling the aroma of freshly made toasts. Slices of bread are dipped in an egg-milk mixture with additional flavourings, placed on a pan greased with butter and cooked on both sides until golden brown. You may add additional toppings like powdered sugar, maple syrup, whipped cream etc. Add milk, sugar, vanilla extract, ground cinnamon and mix well. Heat a pan over low-medium heat. Dip both sides of a bread slice in batter for few seconds and place on the pan. Cook each slice for about 1 minute per side or until golden brown. Add more butter to the pan to cook the other slices. Serve hot with toppings of your choice. You may even dust the surface of each bread slice with powdered sugar. 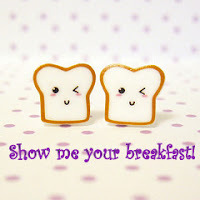 Show me your Breakfast event hosted by Divya of Dil Se. my husband is xpert in making this toast...but yeah he never uses vanilla though! I'm sure it adds more flavour! My favorite breakfast. Nice recipe. Healthy and tasty breakfast..Adding cinnamon and vanilla extract is really a kick..
mmhh cinanmon in toasts...now that must have tasted so good....looks delish. Ramya, yes I can imagine your situation! Though we both give a thumbs up to this one there are other dishes where I need to change the original version to suit his taste!! Hey pooja nice post never tried this and this is new to me by adding vanila extract also will try. cinnamon, vanilla, cinnamon and vanilla - nutmeg, nutmeg, cinnamon and vanilla - I like french toast! I mae the same way pooja but i dont add cinnamon and vanilla..I use cardamon powder.. This is our breakfast during holidays! Wonderful recipe! looks so delicious Pooja! I never made it at home. When I first tasted it I thought egg smell dominated it, so didn't try it again :) But your toast is so mouth-watering. Yum! BTW, the first pic isn't loading, please check. Uma,the addition of vanilla extract and cinnamon would mask the odour of eggs. Thanks a lot... I'll check the picture. I have edited the post Uma..Hope you are able to view the image. I guess slow network at the time of uploading may have caused the image not to be uploaded properly. My kids fav bfast.But prefer adding salt and chilly powder than sugar. 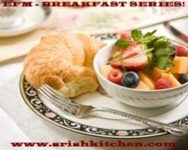 Pooja, this is very easy breakfast recipe. I have always heard of french toast but never the recipe will this simple.Can try this during this weekend. Just love it..makes me hungry! nice toast , but does it taste the same without eggs ? iam a vegetarian.Will try this based on ur reply. :)I wish to try this.. Thanks Vandya, yes this is very easy to prepare. WoW! mmm i want those cinnamony french toast :)).. I love french toast but don't make them often. That would be good on the Mother's Day brunch. who can say no to this flavourful, yummy Breakfast ? The color of ur french toast is just perfect. Nice pic. Simple and easy to make. Looks yummy. Looks yummy... simple and easy... my kids will love them :)... like others have said never have used vanilla essence on these. Will try adding and let u know. This is the first time I added kasuri methi and it tasted awesome. U were also intending to post a similar entry? French toast looks yum. I use to make this, but addition of cinnamon is new to me. Lovely recipe. POresentations s just superb.......me n my hus loves this dis toast alot...whenever im runnin out of time, this s d breakfast i make..n he loves it...snap s just superb dear..
totally agree with you on the french toast..no breakfast as easy n simple as this..and the biriyaniiii...ummmm...me too had my lessons from a malabari muslim lady, but a small doubt on the addition of coconut milk while cooking the rice..is it always this same ratio...half coconut milk, half water ?? Thanks Priti. While making toast always keep the heat some where near medium. The pan should not be too hot otherwise your toasts may get burnt quickly. What was the prob before? What it with the batter or final prep?